Being a gardener I am always amazed at the diversity and industry of the bees we see in the beds we tend, and for some time I had wanted to learn about beekeeping and why bees do what they do. 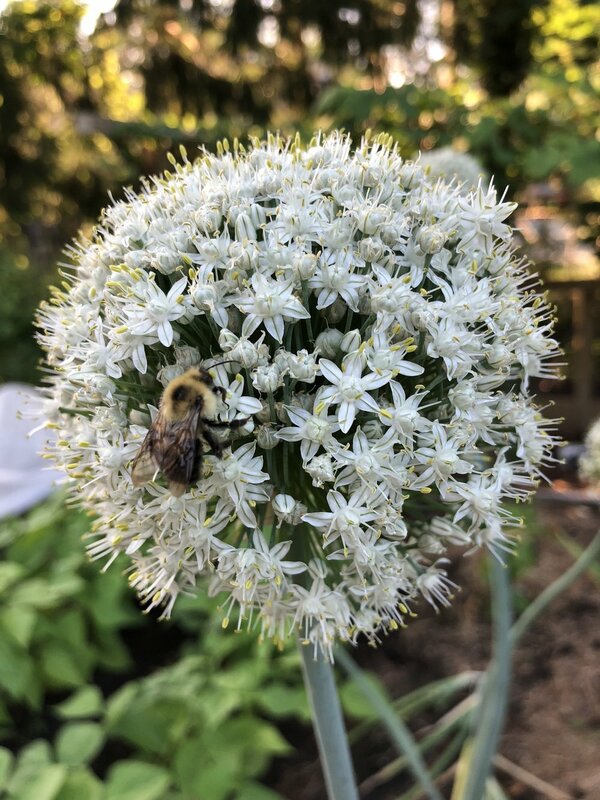 I was also keenly aware of the crisis surrounding the honeybee - colony collapse disorder, the absconding of hives, the controversy over neonicotinoids - and wanted to do whatever I could to help the bees in our area. Last fall Rand and I made the decision to sign up for a beginning beekeeper class offered by the Barnstable County Beekeepers Association in order to learn to how to be beekeepers, or “Beeks” as the keepers call themselves. If you are considering becoming a beekeeper yourself, I highly recommend joining your local association and taking any classes they offer. The information gained was extensive, and even more important, the advice from experienced keepers is invaluable. There is a very large learning curve when it comes to becoming a beekeeper - much more than I anticipated - and just like gardening there is always more to learn and different approaches and techniques used to address the same issue. 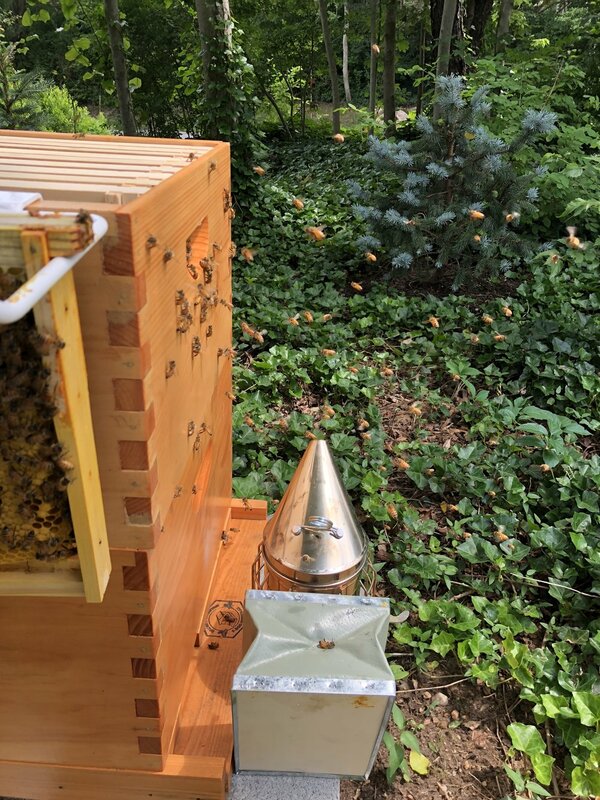 With experience comes the knowledge of what works best for you with your particular hive setup and location, and the confidence which goes along with that. After several months of meeting once a week the class was over, spring was soon to arrive, and the packages of bees were making their way up north from the supplier down south. We had assembled the hive parts (lots of nailing, glueing, sanding and lacquering! ), cleared an area near the vegetable garden and set our hive up on a stand. After one last review of our notebooks, we went to pick up our package of bees. Now a package of bees sounds tame, like they are in a box all nice and secure. In reality a “package” is 10,000 bees in a wood and wire screen box which is mostly screen. There is a can inside with sugar syrup to feed the bees during the journey, and a separate small cage containing the queen bee. So… we put the package in the back of the car on the floor and drove home, all the while hoping we didn’t have to make any sudden stops. I felt like a new parent when they send you home from the hospital after having your first child - we had read all the books and took the classes and still were panicked that we were going to do something wrong and our bees wouldn’t survive. As it worked out, we did fine and installed the bees into their new hive, and we were quite relieved that it all went ok - until it didn’t. Turns out our queen decided to leave the hive once she was out of her cage and most of the bees swarmed off with her. 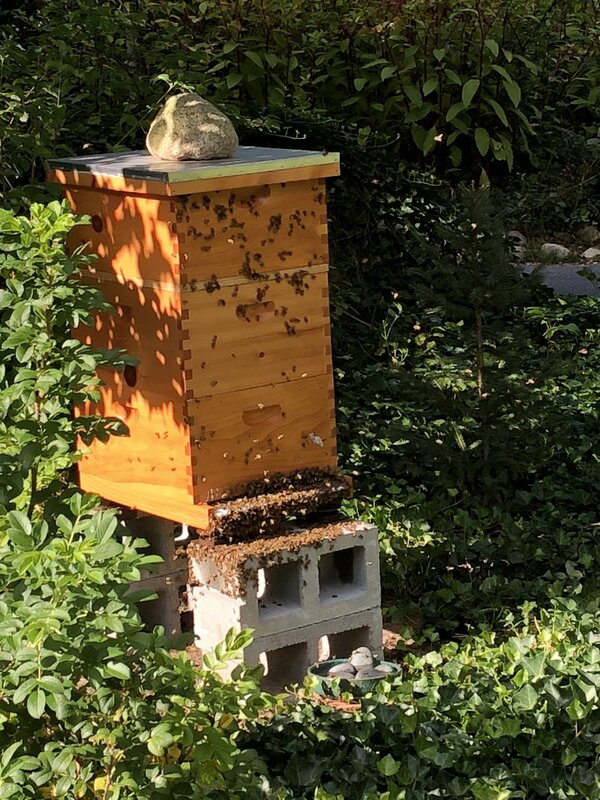 This can happen if a colony is getting ready to swarm before it is packaged for sale, and there isn’t any way to know if your bees are bent on leaving before you install them. Feeling very much a failure already, we ordered another package and tried a second installation a few weeks later and - success! The girls stayed, and the hive thrived all summer long, and we had an amazing time observing them and caring for them and gaining a bit of confidence along the way. Though we weren’t able to harvest any honey this year - since the bees had a late start they needed to keep those reserves for the winter months - the whole experience was extremely rewarding. We’ve tucked them in for the long cold stretch, crossing our fingers that they will survive huddled close in their cluster in the center of the hive until spring, and we will have the gift of being keepers to the bees once again. 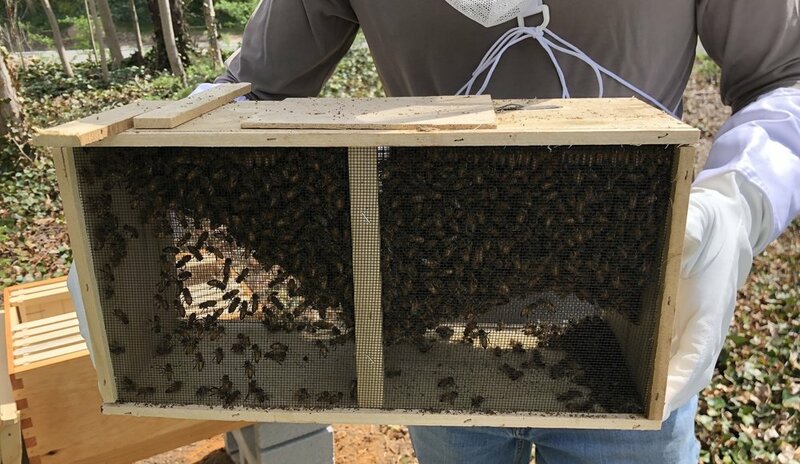 Our first package of bees - 10,000 girls (actually the few drones are males but the majority are female worker bees) and the queen bee in her separate cage. The queen is caged for her protection - since she is newly paired with these bees they must get to know her scent before she is released, otherwise they will kill her. The cage she comes in has a candy plug that the bees eat through over the course of 2-3 days and by that time they will not harm her. Bees in flight towards the hive, smoker at the ready during an inspection but rarely needed since they are really very gentle. Bees are building out the comb on the new frames and the queen is starting to lay brood (eggs) in the cells which the worker bees then cap over. A closeup of the honeycomb cells with the white larvae visible inside alongside capped cells. Bees are very exacting creatures and they set up the layout of the frames in a specific order. The lighter colored band at the top of the frame is capped honey, and the brood is always placed below. 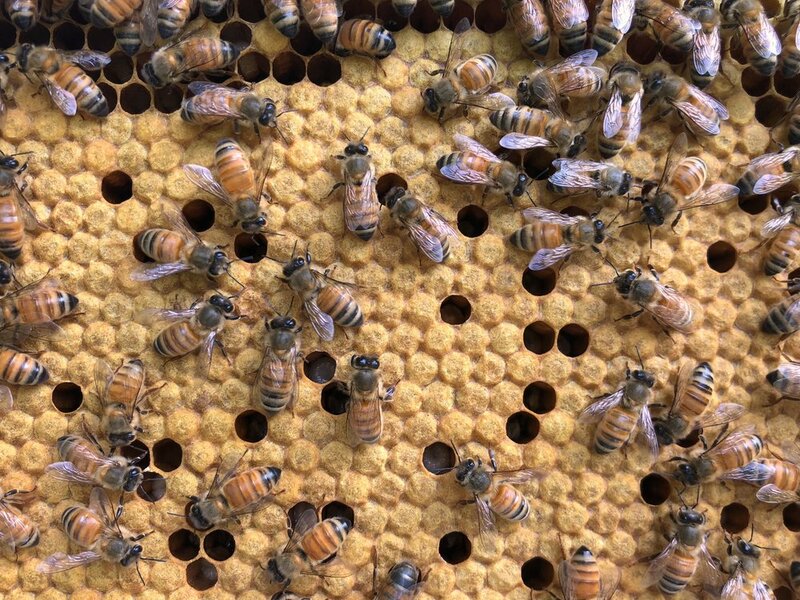 When your hive becomes queenless, either due to a swarm (queen leaves with a portion of hive bees due to overcrowding or other causes) or old age, the workers can make a new queen in a queen cup (larger protruding cell at top left that looks like an upside-down cup). Sometimes they make these just for practice and to scare the (new) beekeeper into thinking something has happened to their queen! The large boxes which hold the brood and honey frames are called “deeps” and we have a top and bottom deep on our hive. Here you can see the girls are beginning to fill up both deeps. When the bees are too warm in the hive they will spill out onto the entrance area in a manner which looks like a beard, hence the term “bearding.” This also can occur when the hive is being treated for varroa mites, a very destructive pest of the honeybee which is responsible for the collapse of many hives since its introduction to the United States in 1987. A happy bee foraging for pollen on an allium blossom. Bees collect pollen in their “pollen baskets” and mix it with nectar to form a protein-rich substance called beebread which is primarily used to feed the larvae.